Bansko’s popularity continues to grow, for the sixth consecutive year, the city has been declared Bulgaria’s No. 1 ski resort of the highest resort in the world’s tourism industry. 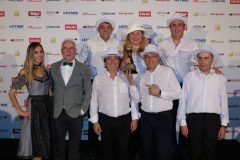 The Pirin Mountain Jewelery received a prize from the World Ski Awards Academy at the Arosa Hotel in Kitzbuehel in the Austrian Alps, making it among the 26 most desirable destinations on the planet. The Bulgarian resort is among the 8 places on the planet, which have 6 prizes of 6 World Ski Awards.